Foreword: This book will make practitioners in marketing, PR, advertising, communications, and any professional with the word digital in his title uncertain about the future of his discipline. Philip Sheldrake makes the case that the traditional boundaries of these professions must morph into a more holistic expertise, which he calls the influence professional. And while such professionals must retain their creative right-brain talents, they must become far more skilled in left-brained analytical competencies. The Business of Influence is a whack on the side of the head for traditional marketers. By focusing on influence, instead of traditional marketing think, it reframes and redefines everything that a modern marketer does. The Business of Influence should be found, dog-eared and jam-packed with marks in the margins on every successful CMO’s desk. Philip Sheldrake shares an important vision of the new communications world order. PR and advertising professionals need to sit up and take note. Influence is the future watchword – and the smart companies are already exploring it and switching models. Today, every organization is in the influence business. We influence customers to buy from us, employees to work for us, and the media to write about us. Gone are the days when you could be your own island. Now, to be successful, you need to live within the influence ecosystem and that requires a change of mindset. Fortunately, Philip Sheldrake will show you how. 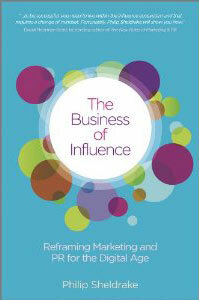 Philip Sheldrake helps us rethink the business of influence. It goes without saying that the social web has transformed the world. Business strategies need to keep pace. Readers should embrace this book and let it challenge their beliefs about the future of marketing and business. Philip Sheldrake was a feisty, thoughtful and passionate audience participant during the AMEC session defining the Barcelona Principles in 2010. His belief that communications needs to change continues in this book, which gives conventional thinking a healthy stir. This is a book I hope major corporations will put on the recommended reading list for their senior management. The Business of Influence is an excellent guide to understanding how to develop and drive a management agenda through marketing and communications in the increasingly complex age of social media and digital technology. It is a handy and useful guidebook for every practitioner from the newly minted account leader in an agency to the seasoned professional or academic in this field. Philip has touched a nerve with The Business of Influence. It’s a highly detailed, authoritative examination on the business of influence, a book of the now. Many unkind observers of the current state of PR suggest it has entered a new age of snake oil sales folk. Sheldrake’s book proves that there is a higher level of thought. It structures a practical study of material which I am sure will prove to be invaluable insight. The Business of Influence is an essential read for communications professionals seeking to keep pace with the new realities of social business. Philip Sheldrake powerfully deconstructs old business paradigms about business marketing and communications in order to align it with the realities of social business so we, as an industry, can rebuild with greater success. It can help the influence professional directly impact the bottom line in this new social media driven world. Philip Sheldrake stalks the world of PR in which digital mediation is taken as a given. The nature of a web of communication is complicated and with Philip’s help, we are beginning to understand how information flows through it. Public Relations and Marketing have always been about influence and his Six Influence Flows and the Influence Scorecard are a real step forward in making sense and evaluating these activities in the digital age. Yesterday’s approaches to influence do not work in today’s world. In The Business of Influence, Philip Sheldrake nails the fundamental problem in the 21st Century – our methods are rooted in the 20th Century.